If the phone number you gave us at registration is amongst 35 low cost destinations, you will receive a call on that number when you login as an agent. If not, you must use a SIP phone to take the demo. This tutorial briefs you on how to use the Hosted VICIdial Demo with a SIP phone. It will make most sense to someone who has some experience operating a predictive / auto dialer. I have split it into 4 sections. Section 2 and 3 will help you get up and running with using Hosted VICIdial Demo. Agents/Phones login: 10 Agents are already created. Agent login start from agent-id 7771 to 7780 with password same as agent-id. 10 Phones are created with username cc701 to cc710 and password provided to you when you register for the hosted dialer demo. Phone username and password go into the softphone for registering them to the VICIdial server (described below). 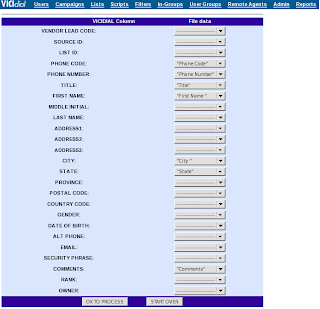 When the agent logs in to his web interface, he is asked for the phone login and password. For security reasons these are different from the phone username and password put into the softphone; agents need to use phone login from 701 to 710 with password same as phone login. Campaign: A default campaign named 'Campaign 01' is already created for you. The campaign is set to manual dialing. Carrier: A carrier is a VoIP trunk provided by the VoIP service provider to route your incoming/outgoing calls. For the hosted dialer demo we have already configured a VoIP trunk (carrier) for you. 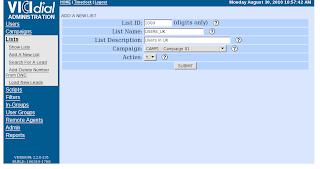 Upload leads into the default campaign. Please note that you can also modify your campaign settings if you want to, but mostly it would not be required. Modifying campaign settings is described later in this section. 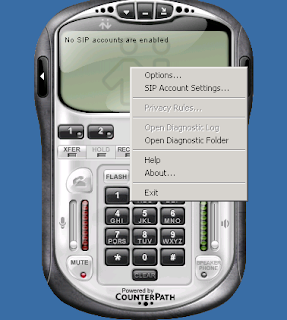 2.1 Steps to configure softphone. 2.1.1. Download X-Lite from here and install it. 2.1.2. Start X-Lite. Right click on the phone and select 'options' menu. Then goto 'Advanced settings' --> 'Audio codecs' section, disable all codecs except speex. 2.1.3. Register to VICIdial. Right click on the phone, select 'SIP Account settings' then click on ADD to configure your SIP phone. Eg below shows phone cc701 being configured. Password and domain will be provided to you when you register for the demo. Domain proxy section: Select 'Register with domain and receive incoming calls' and 'Send outbound via domain'. Click on apply and the softphone will automatically register with the server provided you enter correct details. For uploading leads, first create a list, assign it to the default campaign then upload leads into that list. Login as Administrator and click on 'lists'. Click on create a new list. List ID: Unique list ID. List Name: List name between 2 to 20 characters. List Description: Something descriptive (optional). Campaign: This list belongs to the selected campaign. Eg below shows list being created with following values. 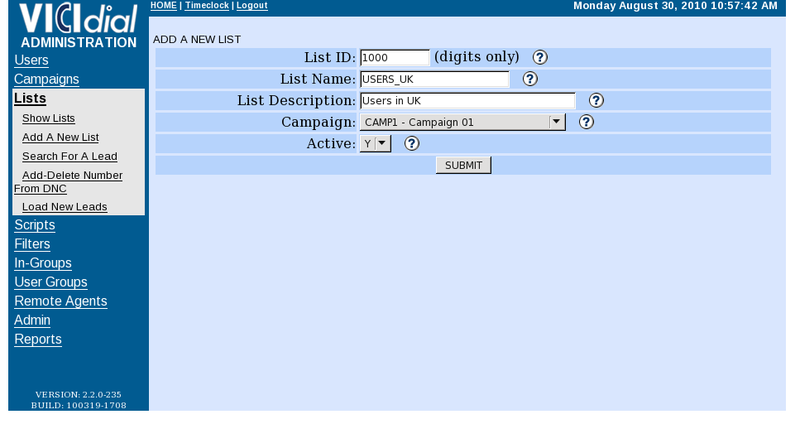 List Description: Users in UK. After list is created, upload leads into it.For uploading leads click on 'lists'. Click on Load new leads.Leads file should be in .xls,.csv or plain text format. See sample leads file. 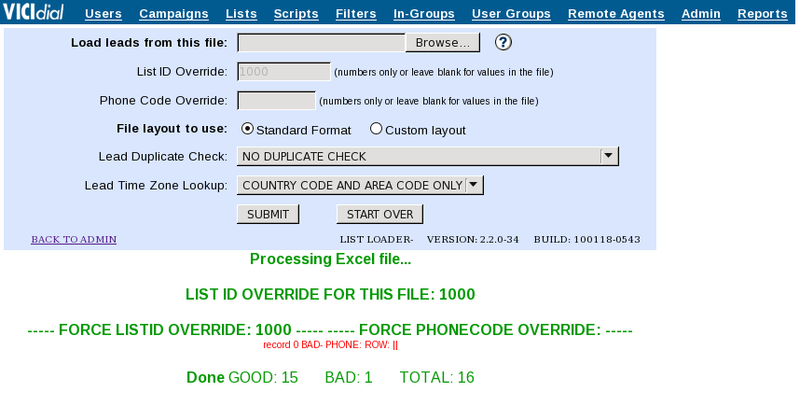 This file can actually be used to test the dialer.Enter following details in the list-loader page. Load leads from this file: Browse your leads file and upload it. 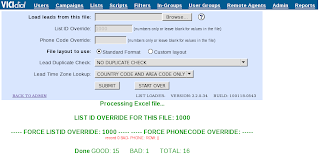 List ID Override: Enter List Id of list which you just created. Leave rest of the options to default value. Click on campaigns. Select the campaign whose setting you want to change. Change 'Dial Method' to RATIO, and 'Auto Dial Level' to something greater than zero. In this section you saw how to configure your softphone, upload leads into campaign and also modify campaign settings. Next section shows you how to get started with using VICIdial server. Agent with agent-id 7771 and password 7771. Web interface phone login 701 and password 701. Campaign name "CAMP1 - Campaign 01". After clicking on submit, you will be redirected back to the VICIdial console where you can start making new calls. The demo above has a daily limit, after which the server will automatically shut down. However, your account will automatically be credited with demo credit after a few days, when you can resume your experimentation. Do not go beyond a single agent when in demo mode.Signing up after the demo is also easy. Start depositing money into your prepay account, details of which are sent in the email when you register for the demo. You do not have to use OwnPages minutes in production. The first payment must be of USD200 by PayPal. This will not appear immediately in your account till we cross check with you. Subsequent payments will be immediately credited. On first payment the demo server above will automatically be converted to production. As a security measure, your calling is limited to 35 low cost destinations. contact us via the forums after sign up if you want to call other destinations.